1. Look for wide and short bodied, with a deep chest. Also look that they have a wide stance and stand square on their two feet. For the rooster, look for a nice short back, and a tail so fluffy and round it almost touches the back of the crest. Same for the hens. I personally put much more value in a solid breeder over the fancy show bird. The breeders are were it's all at. If you don't have solid breeders that produce well, basically you have nothing. 2. With a rooster, look for a nice crest. Not neccessarily huge or vaulted, but rather medium sized, remember balance is the key. And make sure they have a nice full beard. 3. The comb is a hard one, these don't always turn the best especially on the colored birds. They should walnut in shape, not huge, or bumpy. Think of the color as that of the polk berry, which is a very deep purple color, almost black. 4. Wings should be tight, folded under and held close to the body. It should not have any split either, it should be nice and full. Wings should always fold under not out, and watch for lazy wings, where they just hang. Remember, a correct wing should snap back into place, not sag. 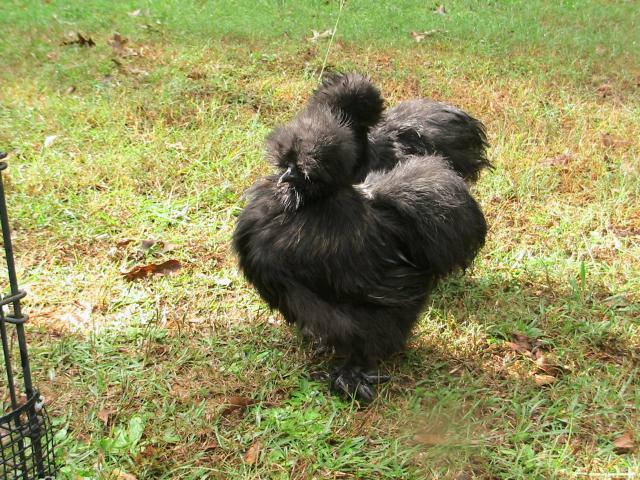 Correct silkie wings should be shredded on the ends. 5. Your cushions should be very full and soft. Especially your females. The male is permitted to have a few hard feathers, in the wings and feet. But, the tails are perferably soft with no hard feathers, (but may contain shredded feathers). 6. Heavy, long feathering on the shanks and feet is desired. And, you want that foot feathering all the way down the middle toe. 8. You want a nice dark eye, almost black in color. 9. The color, what ever you choose should be correct, with no off colors, brass, brown, gold silver ect. that just means there is something underneth, stay far away from those birds for breeders. I think balance is the key. A HUGE crest is so attractive to some people, but it's just one part of the bird. There are many parts of a silkie that have to be right to make a solid bird. If you are breeding to show, the entire bird is being judged not just the crest.